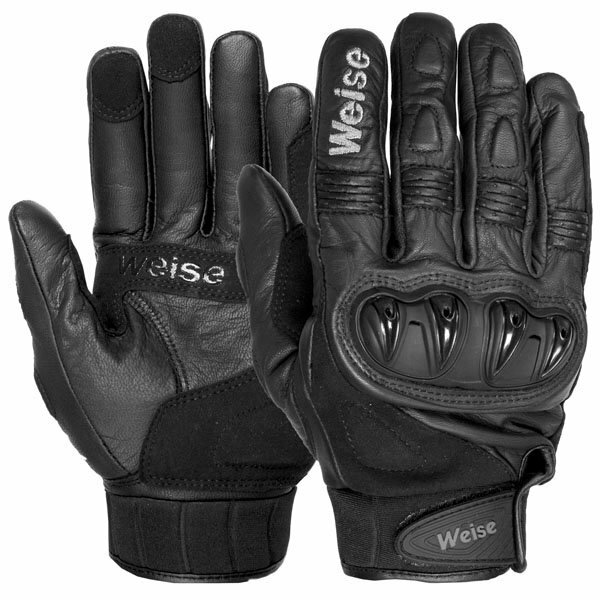 After owning a pair of Weise Datona gloves and in need of a new pair for 2019 a was disappointed to discover that they we're discontinued. I have had many other makes of glove but none I liked as much as them. But my disappointment turned to joy when these arrived. The quality is as good if not better than the Daytona's and they feel a little stronger. An excellent buy! Nice gloves, good fit with plenty feel. If you are like me and find most gloves are too long in the fingers then these will be perfect for you. As ordered, good quality, great price, fast service. I needed a new pair of gloves and as I have shovels for hands I was concerned about the size but when they arrived all my worries slipped away. Too coin a phrase they fit like a glove. I will certainly be ordering from Sportsbikeshop again. Lightweight but robust, perfect for summer. It's the perfect glove for the summer and the transition into winter. Slightly fleece lined inside, and a great fit. Would 100% buy again. I've had a pair of these gloves for a good number of years. Sadly (long story) I lost one of my gloves. I was straight on the net trying to find them again, half assuming they where no longer available. I'd had my old pair a good few years. Delighted when I found them with this firm. 1. Economical. 2. Light and comfortable. 3. Fit nicely (like a glove should) on the hand. 4. Despite wearing a glove hand retains sensory feel. 5. Light weight. 6. Great short summer glove. 7. No armour but still feels like good hand protection. 8. Good protection from wind and rain. Whilst I use mine primarily as a summer glove I do put them on, on cold days. Great pair of Light Weight summer gloves, delivered swiftly. A good hassle free purchase. Buy them, certainly value for money, you'll not be disappointed. They look cool and fit like a ... well like a glove actually. Well made and with textile panels and a short cuff they are good for long summer rides. Although not waterproof, I've found that they keep my hands dry in short burst of rain. Nice light breathable. Appears to be good value for money. These gloves are fantastic! Perfect fit and very comfortable, provide good protection compared to most other summer gloves. Very pleased with these gloves. Comfortable to wear, light and cool. Good knuckle protection. Best price I found on the web. Very prompt delivery. Had a pair of these before and they're just so comfortable and they deliver fantastic protection and they look awesome too. Perfect for summer use, definitely recommend to anyone who is looking to buy affordable gloves. 1st order on Sportsbikeshop and wont be the last - amazing service. Fitted perfect as per size guide - lightweight and comfortable - no extra protection on palm just leather but that's as per description & what I was expecting. Best choice...perfect size...fast delivery...no more words needed...just order. Worn them a couple of times and they're of good quality, would recommend. Fit well and at a good price too. Well made and very comfortable leather glove. Lightweight but they still prevent windchill on short journeys when the sun is not shining. Good armour which will protect but is nice and flexible so does not restrict finger/hand movement. Great value for money. These gloves are a great lightweight option. Very well made and extremely comfortable. With the added bonus of protection. The most comfortable and well fitting pair of gloves I've ever bought.